Koogler Homes, Inc. and Spiro & Associates have spent the past 25 years growing, evolving and prospering together. Today, Koogler represents clientele longevity for the Agency and this Agency’s ability to change when necessary. Now, we reflect on continued success and a job well-done. Following decades of work in the Iowa building industry, President Don Koogler moved to Southwest Florida and started his own home building company, Koogler Homes. 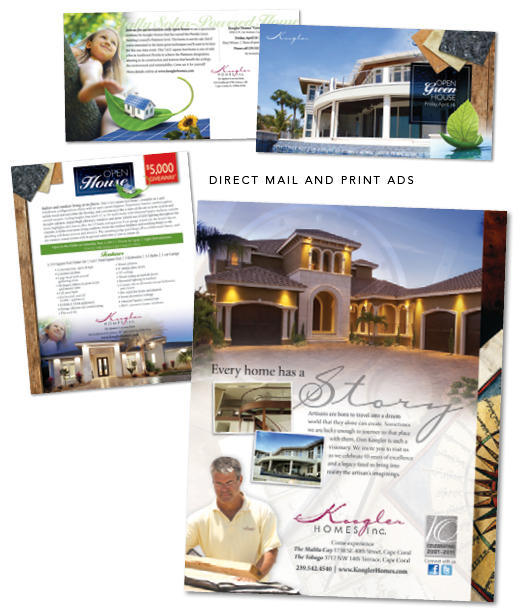 Seeking to expose innovative offerings and a family legacy of premier residential real estate, he hired Spiro & Associates to brand the company via renowned print and digital campaigns that focus on customization, participation and quality versus volume. Don desired an agency that would take him from being just another home builder to the reason that people flocked to Southwest Florida — for high-end, one-of-a-kind residences in upscale communities. Our designers, writers, web developers and public relations specialists started with a branding campaign positioned around a unique residence that is built with care and guaranteed to conjure enjoyment for home buyers. Appropriately titled “Our Signature is on Every Home,” campaign collateral suggested not only that Don Koogler is actively involved in the start-to-finish process of home building, but that one can tell that it is Koogler-Homes-made and approved by a literal stamped fixture on the foundation of every structure it brings to fruition. This set the tone for the next campaign — “When it’s Koogler, it’s Don Right.” This was a catchy play on words that reinforced the fact that Don Koogler has his hands in every company masterpiece, making each home personal and filled with 30 years’ worth of craftsmanship and detail. Blending stone, marble, wood, wrought iron and other natural materials with Don’s enthusiasm for pleasing clients, he can create innovative homes to be proud of. This seemed like the ideal time to tell Don’s story and how that story is retold in every new home he takes on. This multi-chapter book, “Our Story: 10 Years in the Making,” covers Don’s legacy-lined path to timeless craftsmanship and new options in luxury living via relationships, “green” building and an open-ended future. The story features a prominent image of a telescope to suggest hard work and a look ahead. 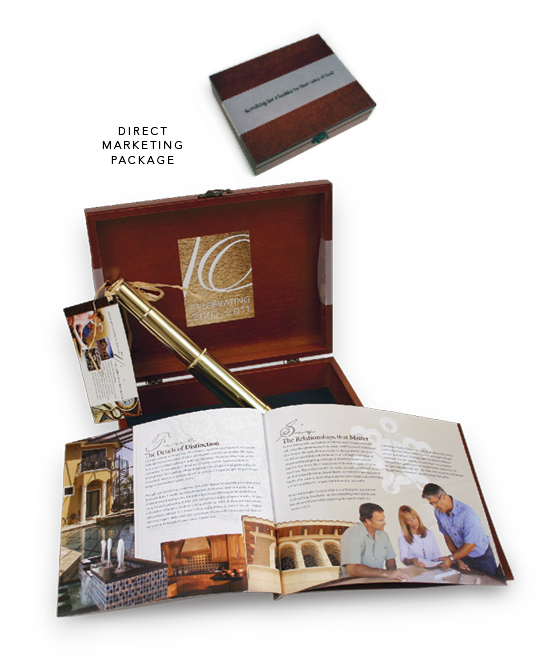 With brochures, a website, additional e-blasts and spoken word, along with a 10-year anniversary campaign, logo and DVD, Koogler Homes became a local luxury company with a dedicated leader at the helm. Then, it was time for the company’s next evolution, centered around the multigenerational influence that is Koogler Homes. Don’s son, Dan, headed up the Island Series, a smaller-scale line of homes that seamlessly combines indoor and outdoor living — an ideal blend for life in Florida a.k.a. 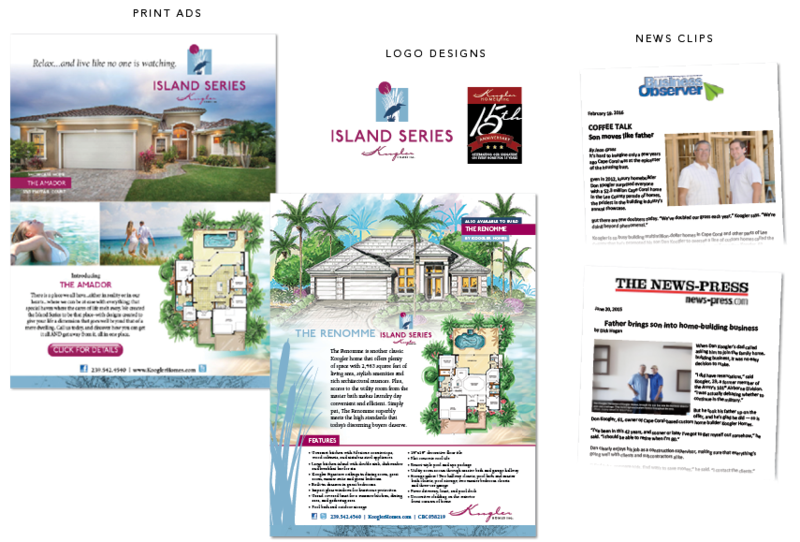 “The Koogler Flair.” As the newest line of product, the Island Series was introduced as magnificent homes that maintain a signature style of architecture, but encompass landscape-infused colors and textures. The Amador launched this line, with a side-by-side guarantee of indoor comfort and outdoor relaxation. 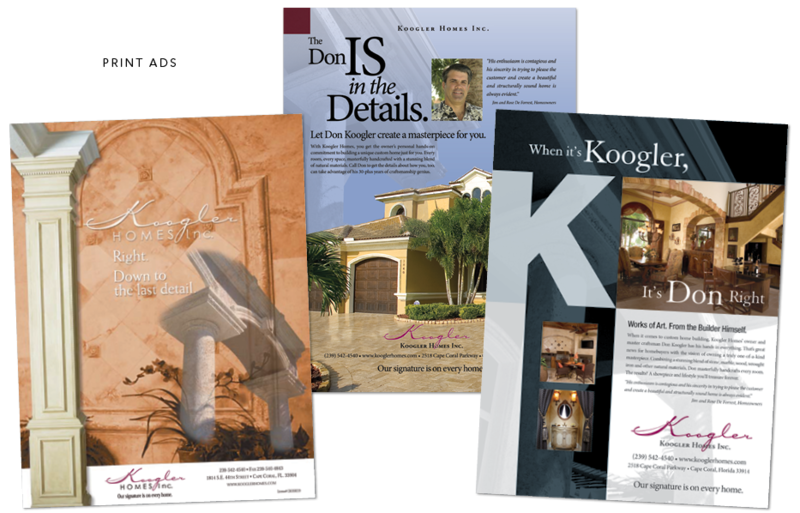 With Dan’s now-prominent presence in Koogler Homes, the Agency created a legacy campaign regarding the four-generation business that began in a distant land and lives in Southwest Florida. It utilized archived and current family photos, as well as the work that both Don and Dan conduct in Cape Coral and elsewhere. 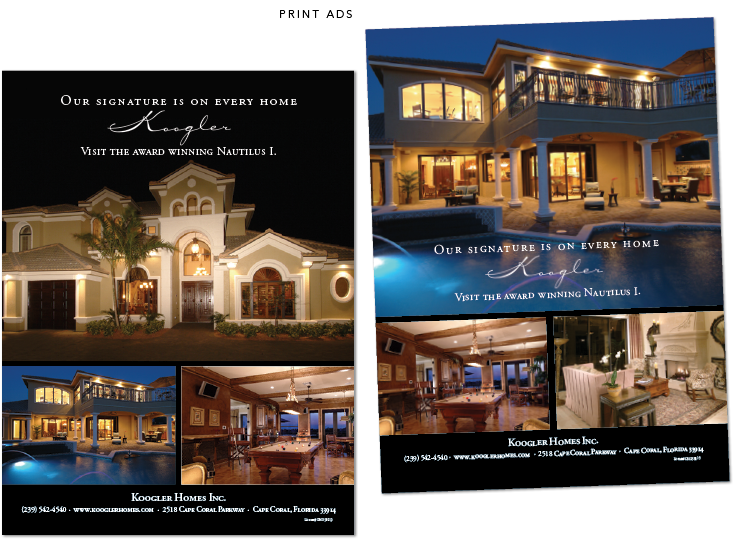 Now in its 16th year in Southwest Florida, Koogler Homes defers to the Agency on a monthly basis for billboards, ads, public relations and much more. Koogler Homes enjoys a reputation of excellence, with steady sales every year and a growing number of interested buyers. Most recently, the Cape Coral Construction Industry Association (CCCIA) named the company Contractor of the Year during the 2017 ACE Awards. This was due to Koogler Homes’ commitment to local economic growth and community involvement. In 2017, Spiro & Associates won an Excel Award for the Bluefin Bay on behalf of the company. Additionally, The Necker Island and Harbour Island each won a Superior Home Award in this year’s Lee Building Industry Association Parade of Homes. Both models also won 21 awards in the CCCIA Showcase of Homes for 2018. To this day, Don Koogler is considered one of the last hands-on builders and is steadily increasing his work volume on a regional level … and the Spiros consider the Kooglers some of their best friends.